Cat Home Remedies for Fleas: if you are looking for natural, home remedies for cat fleas, most likely your cat is itching and scratching and rolling the skin on his back as he gets irritated by these pesky parasites biting him. 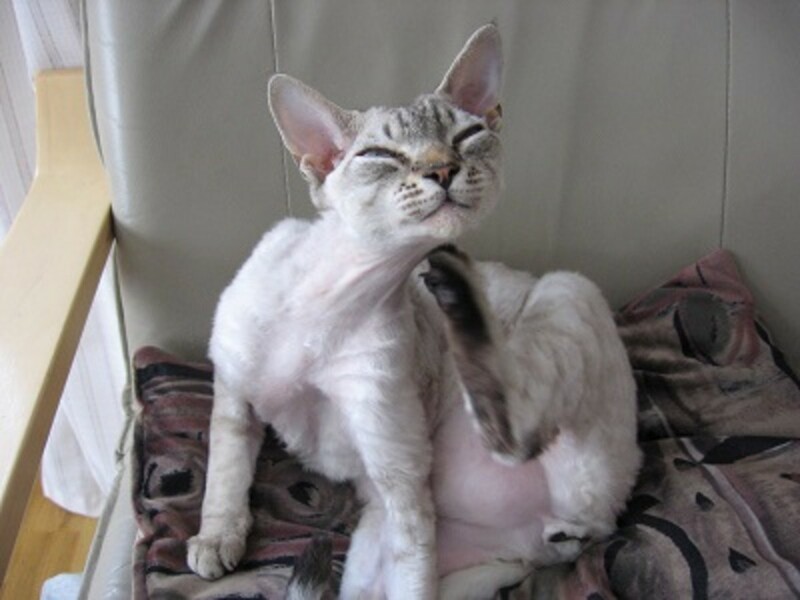 While fleas are a common cause of itching and scratching in cats, consider that not always fleas are the culprit. There may be other possible causes for cat itching, such as allergies or skin mites which can make a cat equally miserable. If you suspect fleas though, there are some distinctive signs that can help you find out if they’re really the culprit. Fleas may be clever, but they often leave some evidence behind. Even if you don’t think your cat has fleas, think again, even one single flea can make a cat miserable, especially if the cat is allergic to the flea’s saliva. Before looking at home remedies for fleas in cats, let’s first make sure you cat has fleas in the first place. Here are five signs that your cat has fleas. If you see two or more of these signs, then your next step is to find out what home remedies you can use. To catch the fleas red-handed, arm yourself with a flea comb to brush your cat. What is a flea comb? A flea comb consists of a special brush made for dogs or cats that has long teeth that are very finely spaced so it can capture anything that gets between them. When you brush your cat with this comb, look at what’s trapped between the teeth of this comb. You’ll likely see lots of dead hair, maybe some dandruff, but if you see something brownish black that’s small as a sesame seed, that’s likely a flea. This test doesn’t involve the use of a flea comb, but requires you to take a close look at your cat’s hair. If your cat is light-haired, you’re in luck as the light hair makes seeing things much easier. Gently part your cat’s hair over the neck and look for signs of debris that look like dirt or small sprinkles of pepper. If you see any, collect some with a pair of tweezers or a flea comb and deposit these little dots on a wet paper towel. You can rub the dots between the paper towel if you wish. If the dots leech some red, you are likely dealing with flea droppings. Yes, we’re talking flea poop here, and to say it bluntly, those dropping are made of your cat’s digested blood. If you ever notice anything that looks like dry grains of rice by your cat’s rear end or on your cat’s poop, suspect tapeworms. When there are tapeworms, there are often fleas, as fleas are the intermediate hosts for tapeworms. All it takes for your cat to get tapeworms is to ingest an infected flea as your cat is grooming himself. There are other ways cats can get tapeworms too, but infected fleas are often the culprit. There are several home remedies for cat fleas, but it’s important to realize that the fleas you see on your cat are only the tip of the iceberg. When your pet has fleas, flea eggs and larvae are likely living around your home either on the carpet, your pet’s bedding or in cracks in the floor. And if you think fleas are only seen in the summer, think again. Turns out, carpets and central heating provide the ideal conditions for fleas to thrive year-round. Removing fleas from your cat is therefore only dealing with a part of the problem, as once the fleas on your cat are dead, the eggs around the home will hatch and soon they’ll back on your pet again. So in order to kill fleas, you need to take a dual-step process: kill the eggs and larvae around the home and kill the fleas on your cat. As mentioned, in order to treat fleas, you must not only kill the fleas on your cat, but must break the flea life cycle and this entails also killing the eggs spread around your home, and possibly yard. Keeping less clutter around the home is helpful as it reduces hiding places. Fleas are very productive and capable of laying up to 60 eggs per day. A flea population can take 4 to 6 weeks to eradicate. Also, consider that indoor cats can have fleas too! Fleas like to hitch hike on people’s shoes and pant legs, so by walking in and out of your home, you can easily introduce them to your indoor kitty. A good place to start is to vacuum under the furniture, over rugs, around all corners, over carpets, over cracks, crevices of baseboards, behind doors, under cabinets and under pillows. Then after vacuuming, you must make sure to toss the vacuum bag or empty the canister in a bucket of soapy water to prevent flea eggs from hatching inside the vacuum and then getting out. Vacuum on a daily basis so you remove as many eggs and larvae as possible and consider vacuuming in hard to reach places as well, considering that flea larvae are blind and like to stick around dark places such as cracks, crevices and corners. Equally important is to wash your pet’s bedding and any area rugs and upholstery in hot water and dry in a hot drier as fleas often deposit eggs in these areas. Once flea eggs are allowed to hatch, the larvae need to feed themselves, but they’re not mature enough to hop on the pet so they’ll be happy to stay put for a while eating old skin, hair and the droppings of adult fleas. Larvae like to therefore stick around the pet’s bedding and carpeted areas. If you don’t feel like doing laundry often, you can use a steamer as this can be effective as well. Not all flea products are created equal. If you want to kill the larvae in your home, you must look for products that contain insect growth regulators (IGR). Products containing insect growth regulators prevent the larvae from maturing and sterilize the fleas so they cannot reproduce. Read directions carefully and use in a well- ventilated area. Most IGR products contain some form of pesticides such as methoprene or pyrethrins so your cat should not be exposed. If you’re looking for products that contain no pyrethrins or permethrins, consider that there are some natural flea sprays on the market made of peppermint oil, cedar oil or clove extract, but they should be applied only around the home and not directly on the pet. Another way to kill fleas found in your cat’s environment, is to use flea traps. These traps attract fleas because of their color, the heat emanated, the sweet odor and the lights. Once lured by the traps, the fleas end up getting stuck to the glue. Flea traps therefore do not use any chemicals or pesticides so they are a safer option. Once the flea larvae are developed, they will build themselves a cocoon where they will wait for the right moment to hop onto your pet. Once on your pet, they will feed on your cat’s blood so they will be energized enough to start to reproduce. Soon, the female will lay eggs, and the whole egg, larvae, flea cycle will start again. Here are some natural ways to kill fleas on your pet. A natural way to get rid of fleas living on your cat is to pass the flea comb all over your cat’s body. This works well especially for those kittens that are too young to have topical flea products applied. Just make sure that in between strokes, you dip the comb in a bucket with soapy water. This will drown and kill the fleas you stumble upon. Do this once a day to keep these pesky critters at bay. You can invest in diatomaceous earth (DE) to use a relatively safer alternative than pesticides. Just make sure it’s not the industrial type made for swimming pool filters which is chemical and harmful if inhaled, instead go with a food-grade type labeled safe around pets. Diatomaceous earth is made of freshwater or saltwater fossils that are ground up into a fine powder. It can be applied to carpets and rugs, but when applied directly on the cat’s coat, it has some drawbacks. According to veterinarian Janet Tobiassen Crosby, food-grade diatomaceous earth can dry out the skin. Also, it can be irritating to the eyes and lungs so best to wear a face mask as you apply it while protecting your pet’s eyes, nose and mouth. Within 12 hours of applying it, shampoo your pet and apply a conditioner. It may be tempting to just go to the supermarket and purchase a cheap flea collar or topical product for your cat, but these sometimes can cause more trouble than expected. Products like Hartz, Sargent’s or Biospot have been reported to cause serious reactions in cats such as rashes, open wounds, seizures and even death. Websites like Hartz Kills and Biospot Victims are unfortunately full of many sad stories. While it may be tempting at times to apply essential oils such as peppermint oil topically on the cat to repel fleas, not all are safe and it must be considered that cats are delicate creatures when it comes to dealing with certain products, significantly more than dogs. Cats are also more likely to lick their fur causing them to ingest the product in larger quantities than a dog. According to a cat veterinarian, cats are deficient in hepatic glucuronidation, one of the main detoxification pathways, making them more predisposed to toxicity compared to other animals. While it’s unlikely for a cat to ingest significant quantities to cause overt signs of toxicity, it’s possible for it to cause subclinical issues. Other products to avoid are flea and tick products labeled for dogs. Products labeled for dogs contain higher amounts of pyrethrins which are toxic to cats. Even being exposed to a dog who has had a product like Advantix applied, can cause toxic effects in cats! If you want to kill fleas on your cat quickly, there are some safer flea products (ie, Advantage, Frontline Plus) available from your vet; however, while these products may be made out of safer chemicals, consider that they are still pesticides and should always be used with caution and under your vet’s guidance. And What About Garlic to Repel Fleas? Garlic is often mentioned as a flea repellent, but it’s not safe to use. Garlic can cause Heinz anemia in cats and dogs, and above all, there is no proof that it works! Indeed, according to veterinarian Dr. Karen, there are no scientific studies showing that garlic can effective as a flea preventive in cats. What’s known instead is that garlic is toxic to cats. An innovative method to repel fleas in cats and dogs, are amber collars. Amber collars are a 100 percent chemical-free option that is suitable for pregnant, nursing cats and young kittens. They work by releasing aromatic terpines which help repel fleas and ticks and emanating static electricity produced by the friction against the pet’s fur which makes fleas feel uncomfortable. On top of that, amber collars look good on pets. As seen, there are several ways to kill fleas, but the most important thing to do though is to do so in a safe way. It’s always best to consult with your vet before trying any products on cats.